Dr. Rick Marshall is the laughing stock of the scientific world because he believes in quantum palentology and that he can prove the existence of time warps. After years of ridicule, a cambridge student who believes in Dr. Marshall's research, pushes him to continue his study of a tachyon amplifier. The two scientist's take their research on a expedition to Devils Canyon, a location which has shown a high source of tachyon energy. Dr. Marshall and his assistant Holly Cantrell, hire the help of local tour guide Will Stanton to take them through the caves rich in tachyon energy only to be sucked through a time warp. Now stuck in an alternate universe, they must try to find away back if they can first survive this strange world of deadly dinosaurs and Sleestaks. "Land of the Lost" was a film that I had very low expectations of going in, regardless of the fact, it had an impressive cast of Will Ferrell and Danny McBride. Most television adaptations have been huge disappointments and I expected no different here. Instead I found, a film that captured the campy tone to the original show but added great dialogue and a plot that was actually worth following. Add the fact that Ferrell and McBride brought their routine flare and "Land of the Lost" was a humorous movie that could definately be enjoyed again. Director Brad Silberling (Lemony Snicket's A Series of Unfortunate Events) delivered an adventure that is fun for fans of the original show and audience members too young to remember the 1970 series. The film moves a good speed and keeps a steady pace with a pleasant mix of action and comedy. Some of the plot points or situations are extremely predictable and absurd, but the film is for all intents and purposes a teen comedy and no one should expect a riveting storyline. The world created in "Land of the Lost" is also pretty remarkable. The production comapny did a nice job on the elaborate sets that help add to the adventure and mistique of the comical film. Silberling does a capable job of recreating the series for film by keeping alot of the main ideas and characters with only slight updates. For instance, Holly and Will are definately not Dr. Marshall's kids, like in the original show. I loved the fact that the studio included the distance shot of the trio crossing a cliff on a narrow rock made bridge, which was used in almost every old episode of Land of the Lost. Grumpy the T-Rex dinosaur also returns, although here in the film update, he has taken a keen interest in Dr. Rick Marshall that was unseen in the television series. Most of the moments with Ferrell and the T-Rex are quite hysterical, however the green-screen work utilized for these scene's is ultimately lacking and could potentially take some viewers out of the action altogether. One avenue that wasn't altered from the show was the Sleestak's. Thankfully the studio decided to not use cgi for them, but instead created suits for the slow moving Sleestaks that matched the original show wonderfully. If you are a fan of Will Ferrell and Danny McBride's unique brand of humor then "Land of the Lost" should be a real treat for you. I have grown a bit weary of Ferrell and his usual schtick, but surprisingly here in "Land of the Lost" he was damn funny as the often wrong Dr. Rick Marshall. Most of Ferrell's dialogue is wrote specifically for his usual tone of humor and it is performed flawlessly. While Dr. Rick Marshall isn't one of Ferrell's best character's, it is definately better than the more recent characters he's played in Blades of Glory or Step Brothers. Danny McBride was the best thing in "Land of the Lost" hands down as Will Stanton. McBride is a hilarious supporting actor and he creates another perfect sarcastic character that is filled with line after line of side-splitting dialogue. "Did you say chorizo tacos? You better not be messing around, cause I am really hungry," is just one of the many example of simple dialogue that when delivered by McBride becomes a laugh-out-loud endeavor. Ultimately, I truely enjoyed Ferrell and McBride's banter back and forth and could not imagine how dreadful this film could have turned out without them. Quite simply, the duo of Ferrell and McBride make "Land of the Lost" worth watching despite any reservations you may have had. Anna Friel, who has proven her talents on the now cancelled ABC television show Pushing Daisies, was a disappointment as Holly Cantrell. Friel's performance however wasn't necessarily bad, but her character is rather, uninteresting and provides no real spark to the otherwise funny adventure. Her character is at it's core a wide-eyed damsel in distress, which would be fine, if she wasn't built up as an intelligent scientist. I also found it absurd that she could speak some form of a primate language with Cha-Ka, a Pakuni apeman the trio find in the Land of the Lost. Cha-Ka also annoyed the hell out of me in the film. Played here by Jorma Taccone (Role Models), Cha-Ka was nothing more than a horny pubescent character that seemed directly aimed at the younger audience members. In the original show, Cha-Ka was a nusance, but he was also a representation of youth and exploration. Here in the update, Cha-Ka is used for cheap jokes that may have been funny for kids, but did nothing but take me out of the otherwise amusing film. 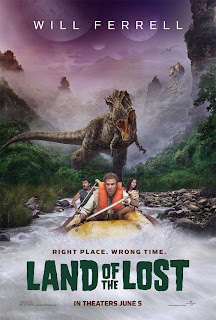 Overall "Land of the Lost" was surprisingly good and it most definately is a film I would watch again and again. Ferrell and McBride carry the film with their outstanding comedic banter and eventhough the story is simplistic, the laughs and adventure are enough to outweigh the negatives. The content and maturity level in the film definately warranted the PG13 rating. The film teeters the line between a children's adventure film and a bit more of teenage comedy with dialogue and content that some parents may want to avoid. That said, as a kid I never caught all the sexual references in comedies like Airplane or The Naked Gun, and most kids would also miss them here in "Land of the Lost." Ultimately "Land of the Lost" was a nice treat and one of the better television adapted films to date.